Integrated seatpost, integrated seat mast, ISP…in the past few years there have been a number of different frame designs on the market that eschew a traditional, round/cylindrical seatpost that inserts into a seat tube. Instead, these frame designs have seat tube structures that extend far beyond the top of the top tube and incorporate some sort of specific fitting to hold the saddle atop. What does an ISP offer? Is it the wave of the future? What should you know before you buy one? First of all, “ISP” appears to be a Giant Bicycles product name, but since it’s convenient I’m going to appropriate the term for this article. I’m going to refer to the piece that attaches the saddle to the “integrated seat tube” (or “seat mast”) as a seatmast topper, which is actually Ritchey Design’s term for their product that several bicycle manufacturers, Scott among them, use for their own ISP frames. In addition to fore-aft/tilt of the seat clamp like conventional seatpost, a seatmast topper frequently allows for some measure of vertical seat adjustment on the ISP, which must otherwise be trimmed to a specific height. Since the seatmast must be cut, typically by hacksaw with a guide, fitting the ISP bike to a specific rider means permanently modifying the bike, much like cutting down a threadless steerer will limit stem/handlebar vertical adjustment. To an extent, this issue is over emphasized by ISP critics; most mast toppers still allow 20mm of vertical adjustment. In fact, Ritchey and Giant offer alternate tall toppers that give an additional 50mm (+20mm adjustment), so it’s not like no one could ever make use of your ISP bike after you. Okay…so Giant created the ISP, right? Well, it’s not so easy as that, because arguably there have been many examples by small custom builders dating back decades ago. It is neither a stretch of the imagination nor technically difficult to make a metal frame with an exaggerated seat tube extension that then takes a highly abbreviated seatpost. This was most commonly seen in one-off time trial bikes, which have often been the canvas for builders to show off their flare or innovation. A past example, though far from a the earliest such, is the Bianchi Crono titanium TT bike from the 1996 TdF, often called the “Berzin” bike after the high-profile Russian rider Evgeni Berzin using it that year. Looking closely at the picture, you can see that there is a round tube (to actually hold a stub conventional seatpost) grafted into the top of extended aero-shaped seat tube. From a fabrication perspective, using a round inner diameter tube to hold a conventional seatpost is orders of magnitude easier than creating a piece that would match either the inside of outside contour of the aero-shaped seat tube. But this type of design is generally not considered to be an ISP, probably because there’s nothing all that proprietary about the design. Giant was one of the first to widely market a production road bike with a true ISP with a development of their TCR series of carbon road frames. 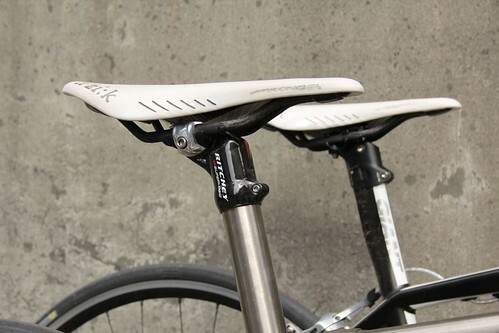 These bikes feature an aero-shaped seat tube extension that takes a proprietary seatmast topper. 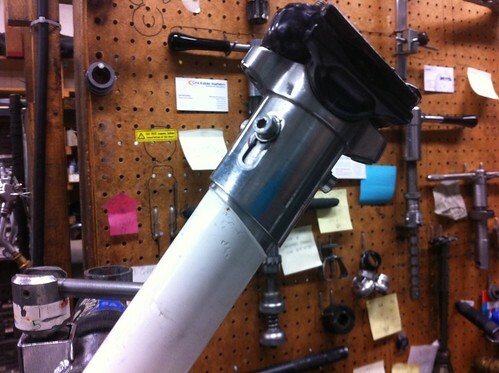 The seatmast topper fits slides down over the ISP and then tightens with a pinch-bolt. I’ll touch upon the importance of this later, but for now it is worth noting that the pinch-bolt merely keeps the seatmast topper attached to the frame. Though Giant’s topper allows for some vertical height above a point where the ISP is maximally inserted into the topper, the pinch-bolt doesn’t provide enough clamping power to maintain position with the rider’s full weight pounding on it during use. Instead, small internal spacers fit into the Giant topper before it is fitted over the ISP, and thus there is no chance for the topper to slip down and lose saddle position after a particularly hard road jolt. After Giant’s introduction of their ISP, several other frame manufacturers have introduced their own ISP, but without the industrial might of Taiwan’s Giant, they have chosen to use mast toppers from component makers like Ritchey and Full Speed Ahead. Much like the Giant TCR topper, the Ritchey WCS Carbon Mast Topper pictured below slides down over the seat mast. However, the Ritchey design differs in that its inner diameter is precisely round, and its corresponding round seat mast would be able to take the compression necessary to generate enough friction between the topper and seat mast to maintain vertical height adjustment without spacers. 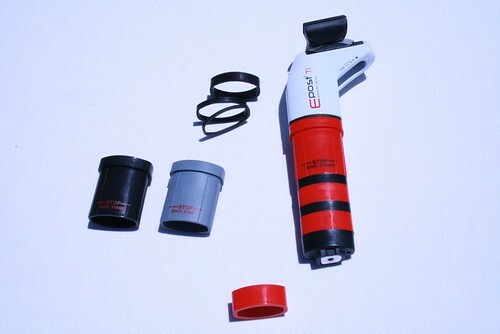 The circular clamp surface evenly distributes the pressure. The aero-shape of the Giant TCR seat mast, in order to be robust enough for a clamping topper to hold without spacers, would have to be significantly heavier, perhaps negating any net weight reduction compared to a standard seatpost configuration. The round Ritchey topper also lends itself to small framebuilders, since from a material availability and fabrication perspective, round seat tubes are much easier to build frames with, especially non-carbon frames. It is interesting that Giant makes similar models with and without ISP. There are net weight advantages to the ISP design, though they are somewhat small and could be also explained by different carbon layups. The Scott Addict, which is made by Giant, used to be available in both ISP (for use with the Ritchey Mast Topper) and non-ISP models, but the latest versions seem to only be offered for a conventional seatpost. Full Speed Ahead makes toppers for both aero-shaped and round seatmasts (pictured below is FSA’s K-Wing Aero Integrated topper). 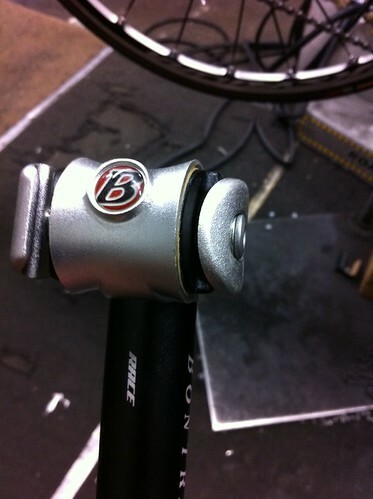 Both insert into the top of the seat mast with an internal expander wedge; however the expander wedge merely keeps topper from coming out of the ISP rather than maintaining vertical position against the rider’s weight while riding. Instead the FSA toppers require spacers to maintain height, in a somewhat similar fashion to headset spacers underneath a threadless stem. Its unlikely that any carbon seat tube design would take an expanding topper without spacers, as the internal pressure to maintain height would likely crack the tube before it could brace itself enough against the interior walls to maintain height over rough roads. LOOK Cycles also use an internal topper for their proprietary design called E-Post. While it uses spacers to adjust height, the E-Post has an expanding elastomer stack rather than a wedge. The elastomers are also meant to provide a measure of vibration damping, and LOOK provides 3 different hardnesses to further tune the ride. 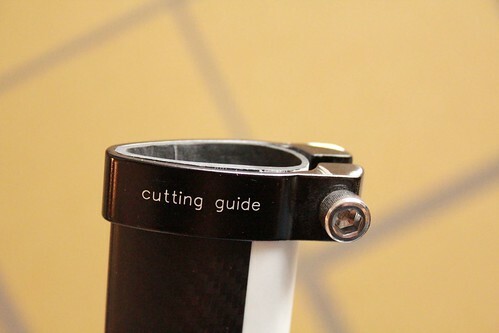 You can also cut down the LOOK seat mast and use a more conventional (though still frame-specific) seatpost. When I used to bring up integrated seatposts when talking with Byron, the first thing he used to say is that none of the local racer dudes liked them. But I had to delve a little bit deeper to discover that those guys were on teams that were issued Trek Madones, which feature Trek’s take on the integrated seatpost. Trek took a different approach. On the Madone and several frames, the seat mast extends well beyond the top tube, but it is shorter than most other ISP’s and doesn’t require cutting to length. Instead, the Madone uses a large topper that clamps down over the seat mast with a pinch-bolt. In my mind, it’s a half-assed design, putting weight up higher than a traditional seatpost or typical ISP/topper, yet you still can’t clamp it in a typical workstand or use anyone else’s topper. 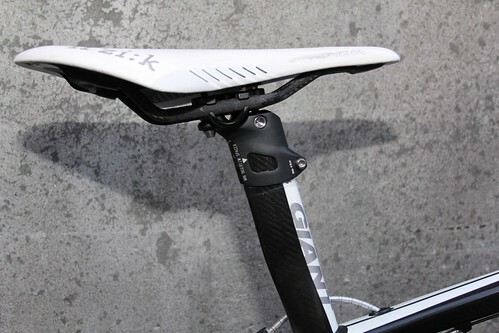 And that’s the problem that Byron was harping on: the style of saddle clamp that Trek uses on their topper (as well as a number of their conventional seatposts), while attractive from a composite engineer’s perspective, is prone to slipping the saddle tilt angle. The design, shared by some of Specialized S-works components, moulds a round socket shape laterally into the seatpost, and the saddle cradle pieces assemble sideways and rely on friction to keep tilt position. On hard bumps, rider weight can cause the cradle to rotate in the socket even if you reef on the clamp. Paradoxically, the friction fit which is often insufficient to properly maintain saddle attitude is more than enough to make it difficult to adjust the tilt. Further, the sideways loading clamp works must exactly match the saddle rail shape, which usually excludes oversize or non-round carbon rails on many premium saddles. 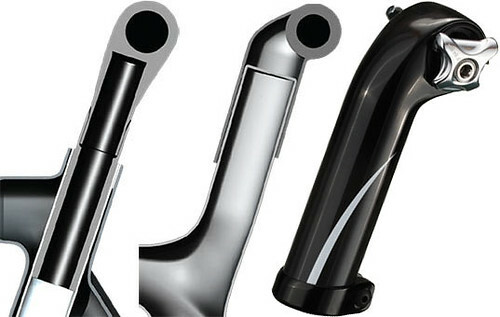 From Trek: Instead of a conventional seatpost, Trek’s Madone boasts a seatmast (image). Compared to traditional seatposts (image, left) and also modern integrated seatmasts, this engineering masterpiece boosts strength and pedaling efficiency, saves weight, increases compliance a whopping 39% (for maximum comfort), and offers all the adjustability you’ll ever need (no cutting required). It lets your Trek fit in a UPS-compatible box for shipping, too! The one true advantage of Trek’s design is that you do not have to cut or otherwise permanently modify the frame, so the bikes should keep their resale value. Also, the bike shop mechanic’s nightmare of cutting too much off before the customer pays for the bike is totally sidestepped. And that thought makes me think that Trek designed the Madone with a bit more consideration for the dealers than perhaps other companies. Coincidentally or not, Trek had special workstand adapters ready for their dealers when the Madones were introduced (non-dealers get no such love). 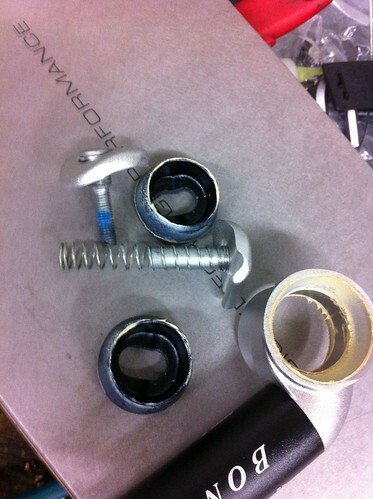 Most bike shops use work stands that clamp onto the seatpost, an act that could crush an ISP, particularly the non-round variety. Many professional team mechanics use stands that clamp onto the front fork tips (front wheel removed) and cradle the bottom bracket shell and thus are less inconvenienced by ISP designs (and perhaps more troubled by the newer bb standards). 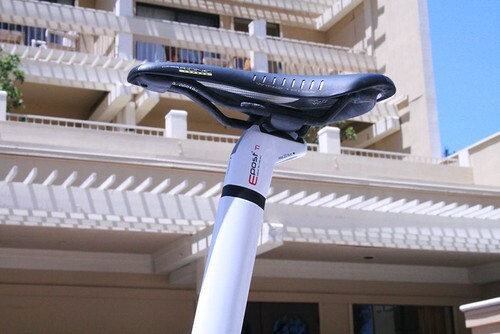 Below is an example of the Trek saddle cradle on a conventional seatpost from Bontrager (a Trek house brand). The Ritchey Mast Topper “1-Bolt” design also has a sideways loading saddle clamp, so Ritchey offers specific cradles for popular carbon rail designs from Selle Italia, Fizik, etc. In fact, I’m not usually a fan of Ritchey products (I loathe their seat posts with two bolts side-by-side), but this 1-Bolt design works very well indeed. Giant’s mast topper and others with similar 2-bolt (fore & aft) neither lose tilt position nor restrict rail shape. Most ISP bikes on the market are carbon fibre. Besides the fact that carbon has largely taken over the high-end bicycle market, carbon’s low density, vibration damping, and nearly unlimited shapes make it attractive. Though uncommon, ISP designs do exist in metal frames. I have experience in designing titanium ISP frames. Titanium is relatively low density but with really good fatigue characteristics, and a seat mast was actually easier to fabricate than a traditional seat tube. A regular 1-3/8” ti seat tube would need a short lug press-fit and welded into the top to bring down the ID to match a 31.6mm seatpost. The thicker wall of the lug also resists weld distortion from the top tube and seat stay junctions. The seat tube needs to be reamed out after welding, then drilled/slotted, and finally a machined collar fitted to hold a seatpost. For an ISP design, you just cut the tube extra long, build the frame, cut it to length, and fit a Ritchey Mast Topper….done. I also calculated that I saved a net of 110gr. The round titanium tubes did limit me to a Ritchey or similar mast topper, but I certainly don’t mind when I need to put the bike in a workstand. Ridley makes an aluminium ISP design. It is an “aero”, non-round shape which may be the same profile used by the Ridley carbon frames. Light though aluminium is, I can’t see that there’s much benefit to this design as the tube walls must be somewhat stout to compensate for aluminum’s poor fatigue characteristics. The resulting structure is not likely to be light nor enhance riding qualities. One could argue that it is aerodynamic, but it would be more truthful to say “aerodynamic styling”. Unfortunately, the Ridley still needs to be cut to length, though their mast toppers do seem to offer a fair bit of vertical adjustment. As far as steel is concerned, I would argue that much like aluminium it is not particularly suited for seat mast designs. If you extend a seat tube far above the top tube, for any lightweight tube you need to worry about buckling the rear wall of the tube. But if you make the tube thicker to compensate, the structure gets heavy quick. I have seen ISP designs from one steel builder where an external collar was brazed onto the top of the seatmast, presumably to either buttress the tube against the clamping force of the topper or to bring the OD of the seatmast up to a convenient size for the custom made topper. Either way, it seems like a poor use of the materials, and I can’t say that I like the idea of a frame’s utility hinging on one-off components. An earlier version of that same builder’s ISP design involved a topper held in place by three diminutive bolts to hold vertical position. Of all the ISP designs I’ve seen, that particular design was the least adjustable. Worse, I could see that post had been slipping because the slots in the topper of the bolts were severely distorted (see picture below). More recently, that builder’s toppers have relied on a pinch bolt similar to the Ritchey, though the mast collar is still used. The only rational argument for steel seatmasts is style. Should you buy a bike with an integrated seatpost? For a buyer, the decision should consider the bike as a whole rather than the ISP being the deciding factor. In some cases like the LOOK, the ISP offers a way of tuning the ride in ways not available in other designs. In other bikes, the ISP model may offer a weight savings. Anyone who says that style doesn’t affect their decisions is lying, but an ISP can be executed in a way that does give structural benefits. It is also possible that the ISP will end up being the reason you don’t buy a bike. It is interesting to note that a number of flagship road bikes have been released lately that have eschewed ISP and gone with frame-specific, aero-shaped seatposts…such as the latest Cervelo and the new Specialized Venge. However, Giant latest TCR SL Advanced proudly features an ISP, as do several other models at the tops of their respective ranges within the Giant road lines.